Anyone who can't discipline himself or herself when it comes to s*xual immorality is playing with his/her Life and Eternity. S*x is very cheap today but it's the easiest way to destroy your life. Be warned! 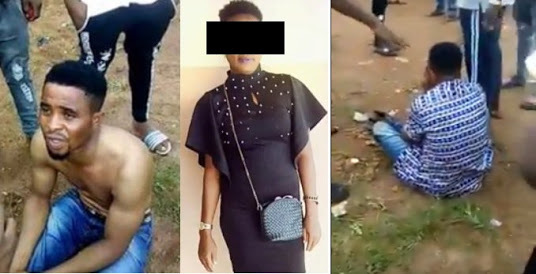 The Christ Chosen Church of God has disowned its suspended pastor, identified as Ngbeken Elvis, who was reportedly arrested over the death of a 38-year-old married woman with four in the Egor Local Government Area of Edo state. The Pastor's wife was giving him troubles, to the extent they separated. He then took comfort in an Adulterous Wife. What a mess! It was also gathered that Elvis could face additional sanctions as he had yet to fulfil the condition given to him by the church to reconcile with his wife in order to have his suspension reviewed. The embattled pastor was said to have been arrested after a woman, identified as Mama Sarah, died while aborting a pregnancy she allegedly had for him during an extramarital affair. The 32-year-old man was alleged to have been in a secret relationship with the deceased for several months, while the woman’s husband was out of the country. The pastor, who claimed to have been suspended by the church over the marital troubles he had with his wife, was said to have moved into the residence of the 38-year-old woman in Okhokhugbo community, where she lived with her children. Elvis, in video clip obtained by Southern City News, told some angry youths, who rounded him up, that the love affair began when the deceased accommodated him in her apartment. He, however, denied the allegation that the death was connected to a ritual. He said, “It was when I was posted to Okhokhugbo branch and did not have a place to stay that she told me to stay in one of the rooms. She was my (church) member. The Police Public Relations Officer, Mr. Chidi Nwabuzor, said that he had yet to be briefed about the matter. But a senior official of the church at its headquarters along the Benin-Agbor Expressway told Southern City News on the condition of anonymity that the cleric went “neck-deep” into his offence by allegedly engaging in an extramarital affair. The source stated, “What the church expected is that when you are suspended, you should put yourself together, ask God for forgiveness and if you turn a new leaf, something could be done about your reinstatement. “The condition the church gave him (Elvis) was even clear; he was told to go and reconcile with his wife. But we pity him. He has no business with us at all.